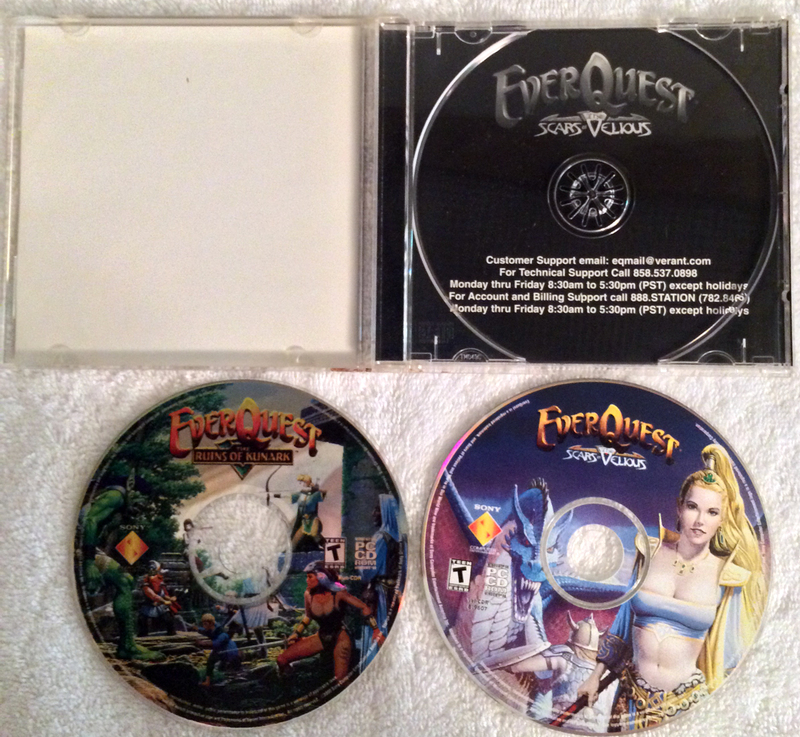 I must admit that I was not a big EverQuest player. 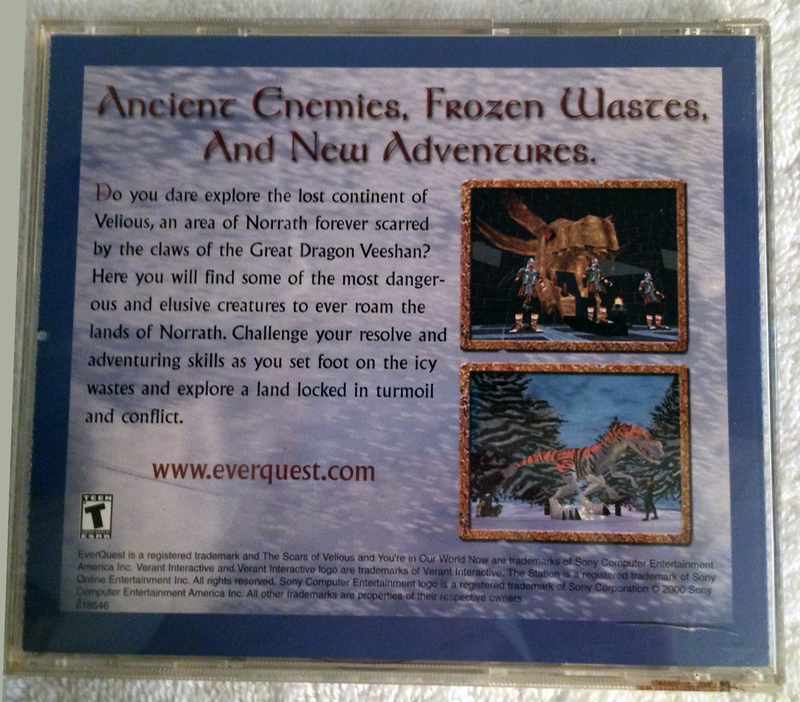 I did, however, try EQ out back in 2000 during the second expansion, The Scars of Velious. Click pictures for bigger images! During my college years, I worked as a sales associate at the local Electronics Boutique, now better known as Game Stop. Our manager, who was also a good friend, would go to trade shows and E3 and all sorts of gaming events, and often brought back copies of free sample games that the vendors provided. One year, he brought back a free copy of EverQuest: The Scars of Velious. He knew better than to play MMOs, but knew that my sister and I enjoyed them. So he gave the copy to us. It came with a free 30 day trial, and a free copy of the previous expansion, so we decided to try it out. I admit, to my embarrassment, I don’t remember a whole lot about the free month I played. I recall the first character I rolled couldn’t see at night without some sort of light source, which made it a super pain for a brand new player who knew absolutely nothing about anything. I didn’t even realize that the lack of nightvision could be a thing and that it was connected to my race. I think I tried another character, which must have been an elf, and was happy to discover other races could see at night. I also think I must have started in Kelethin, because nightvision did not save me from falling out of the tree-city to my death. I’m pretty sure I leveled that character for a little while until I discovered normal enemies were starting to get quite hard for me to take on my own (even under level 10), and the idea was to find other folks to play with. At that point, I wasn’t ready for guilds, groups and serious MMO commitments… afterall, my experiences had been in UO where I could wander around, craft, kill things, and skill up without the need of anyone else (other people were PK-scary in UO, so I had learned to avoid them). Needless to say, I didn’t spend a lot of time in EQ because of this, and probably didn’t renew my sub after the first month was complete. But I still have the box to tell the tale!